AOP Technologies Inc. is a leading knowledge-based stocking distributor of pneumatic, automation, fluid handling and sealing components. We offer a high level of service, from product selection to custom packaging. With knowledge going back over 40 years, our factory-trained Technical services employees will help you make the best selection based on your exact needs. As an experienced value-add distributor, we know how to work with you to ensure your inventory needs are met. We can deliver JIT and help streamline your purchasing by setting up blanket orders, stocking agreements, and consolidating your purchases. We believe in matching the right resources to the customer’s needs. That’s why our customers enjoy access to a multi-level support system. 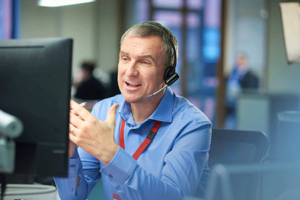 Our customer service specialists are ready to provide you with pricing, delivery, and order entry support. Our field sales representatives work directly with your engineering, maintenance, and purchasing staff to ensure your company’s needs are known and met by AOP. Our technical services employees are ready to assist you in the product application and selection process. Sometimes you just can’t wait days for your parts to arrive. You might have a machine down, or simply be up against the clock to finish a job. That’s where our Super Stock program really shines! We’ve included a comprehensive selection of pneumatic and automation components that we GUARANTEE will be in stock. Need metric fittings and tubing? 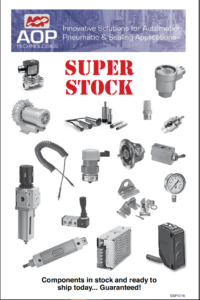 Check our Super Stock catalogs – we stock that. Need air filters, regulators, valves, and accessories in a variety of sizes? We stock those, too. Of course we stock thousands more items than the catalog contains. But, every item in our Super Stock catalog is guaranteed to be in stock. If you catch us without any available stock- we fly it in at our cost! If you’d like a hard copy of the catalog — email us and we’ll get it to you right away.